Ready to jump and capture. British-American checkers rules are the standard rules most players are familiar with. Based on "draughts," checkers has been played in tournaments for over 150 years. A classic board game, checkers is played on a square board consisting of 64 alternating light and dark squares. Upon this checkered pattern, 12 pieces (or "men") are placed. Checkers pieces are small cylindrical disks measuring about 1/6" high. In a set, there will be 12 of a dark color (black) and 12 of a light color (red or white). At the start of the game, players place their pieces on the dark squares of the three rows closest to them. Note: To check if the board is turned correctly, each player should have a dark square on the far left and a light square on the far right of the bottom row. There should be two empty rows in the middle of the board. Once the board is set, it's time to play the game. Checkers rules are quite simple, which make this a fun game for all ages. There are a few rules players may not be aware of, however, such as who moves first or that you must jump if the opportunity presents itself. Pieces can only move diagonally to open squares; all play is done on the dark squares. Pieces can only move one square at a time. Pieces can only move forward unless kinged (or crowned). If a piece successfully makes it to the opponent's final row, it gets kinged. A kinged pieced can only move one square at a time as well; however, it can move backwards to avoid capture. To capture an opponent's piece, jump over it diagonally if there's an empty square beyond it. Make successive jumps if the board allows it. You can only jump an opponent's piece. If there are multiple moves available to you, choose any one. A regular piece can jump a king if the board allows it. The game is won when a player no longer has pieces or cannot make a move. Players can resign or call a draw. Flip a coin to determine which color is played. Traditionally, the player who is "red" has the honor. Alternate colors in subsequent games. During play, if you can jump, you must. Though checkers is a relatively simple game, player strategy does develop over time. What's more, many players will also play checker variants like Suicide Checkers to form new approaches. As for checker variants, common ones are Suicide Checkers, Canadian Checkers, and Italian Checkers. Rules for these games are similar to those of British-American draughts, with slight variations. Suicide Checkers: The rules are turned upside down, with the "winner" wanting to get rid of all checker pieces or possible moves. Canadian Checkers: Played upon a 12x12 board with 30 pieces per player, this game uses International Draught rules. Italian Checkers: Almost exactly like British-American Checkers, with one exception - regular pieces cannot jump "kings." If you're wondering about Chinese Checkers, this game isn't considered a variant. It is its own creation, played upon a star-shaped board that uses marbles (or pegs) instead of "checkers." Checkers as we know it is based on a game believed to have originated in the Middle East. Named Alquerque, the ancient board game is quite similar. It too is played on a square board, uses disk-like pieces, and is won once a player no longer has pieces or cannot move. Dating back to 1400 B.C., Alquerque is indeed regarded by many as the "father" of draughts. 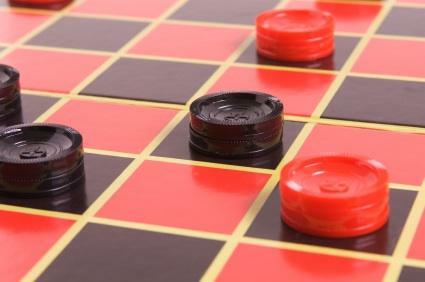 The most well known version of draughts is International Draughts (which Canadian and Brazilian Checkers are based on); however, British-American Checkers is not far behind in popularity. Checkers as we know it, can also be referred to as English Draughts, Straight Checkers, and... Checkers.